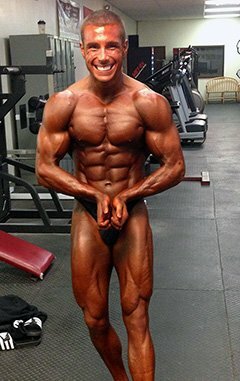 Amateur Bodybuilder Of The Week: Massive Mike! Mike enjoys lifting, eating to build muscle, and learning new techniques to make him stronger. Basically, he loves bodybuilding more than anything! I played basketball, baseball, and football throughout my childhood and teenage years, but switched to football primarily in high school and fell in love with training and lifting. I was the team lifting "guru." My teammates saw the intensity I trained with and the results I got. At one point, I had five teammates training with me. 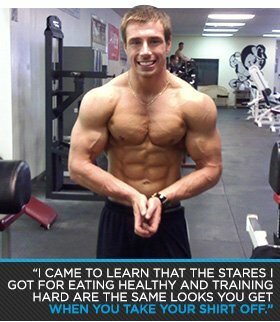 After my senior year, I continued lifting and expanded my knowledge about proper training and nutrition from the forums and articles on Bodybuilding.com. I started with a "dirty bulk" and my strength and size skyrocketed, but so did my gut. I realized I went far enough and started my cut for spring/summer. A few months later, I had a six pack for the first time in my life. This was a turning point. Even though I dieted and did lots of cardio, I enjoyed seeing the changes and progressions my body made. In high school, when I unpacked my lunch with six ounces of chicken, a cup of broccoli, and brown rice, I received stares and looks, but it didn't faze me. I came to learn that the stares I got for eating healthy and training hard are the same looks you get when you take your shirt off. After following proper nutrition and training for more than a year, I finally had a strong physique and a trainer at my local gym recognized. He asked if I considered competing and I responded with "all the time." He convinced me to go through with it and my bodybuilding journey officially began. That fact that my actions have a direct correlation to my performance drives me to get better. If I follow my nutrition plan and train at maximum intensity, the results will follow. If I cheat or give anything less than my all, my performance will suffer. People don't understand that bodybuilding is a 24/7 job. You have to be conscious and perfect with your training inside and outside the gym. You can't miss meals or stay out late and expect to make progress. I love everything about bodybuilding. I love watching my body respond to the stimuli I give it. I enjoy pushing my body to its limits and learning about myself. When it's said and done, I want to sit back and say I gave it 100 percent in every way possible. I enjoy watching Kai Greene videos when I need a source of inspiration. I watch videos of him stressing the mental aspect of bodybuilding. I can hear him right now saying, "The body achieves what the mind believes." Watching those videos makes me realize that I must have the proper mentality going into my training. My current plan is to compete this July in the NPC Collegiate Nationals. I want to make my mark in the NPC with this show. With the package I plan to bring, I most certainly will. You need to find what types of training and nutrition work best for you. There isn't a single approach to training or dieting in bodybuilding. I see too many people fall into a trap and stick to one type. You should continuously experiment with different variables until you find what works for you. You'll know when you have it. My favorite bodybuilder is Antoine Vaillant. I love his physique. He has more of an old school physique, which I idolize. I think he is quite the character. Despite being a serious and competitive bodybuilder, he stays humorous and has a good time. Watching his cooking videos on YouTube during my contest prep had me laughing mid-cardio. Bodybuilding.com helped me tremendously to reach my goals. When I first started my journey, the information I used and gave others came straight from the site. I read countless articles and threads on Bodybuilding.com. Bodybuilding.com helped me greatly with supplementation. I order my supplements from Bodybuilding.com because they offer the best selection at the most competitive prices.